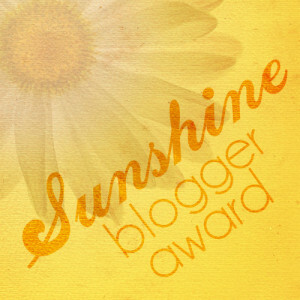 This is a guest post by Sherry (she wishes to use only her first name). 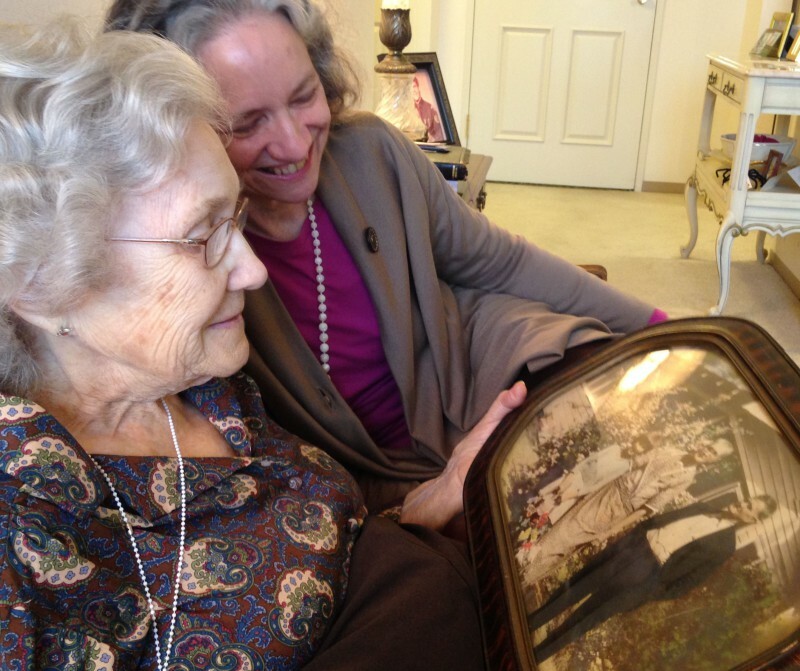 Sherry and her mom Bertie looking at a photo of Bertie and her grandparents when she was 8 years old. Photo taken by Sherry’s brother Rick. Since January, I’ve been in Austin, taking care of my mom, more than I’ve been home in New York. It turns out my mother has colon cancer. The good news is, the lesion is slow growing, not causing her pain at present, and not obstructing her bowel. However, it is causing anemia, and this symptom will be the direct cause of her death, probably sometime this spring. We tried the least invasive treatment possible, intravenous iron infusions, to no great effect. She’s 92 and frail, so there is nothing else that could help without triggering a slew of side effects that would cause greater harm, quite possibly far greater harm. Therefore the plan is to keep her comfortable. I have engaged hospice services; a team actually comes to her assisted living facility, which means she does not have to leave her home, thank goodness. She is fairly stable for now. 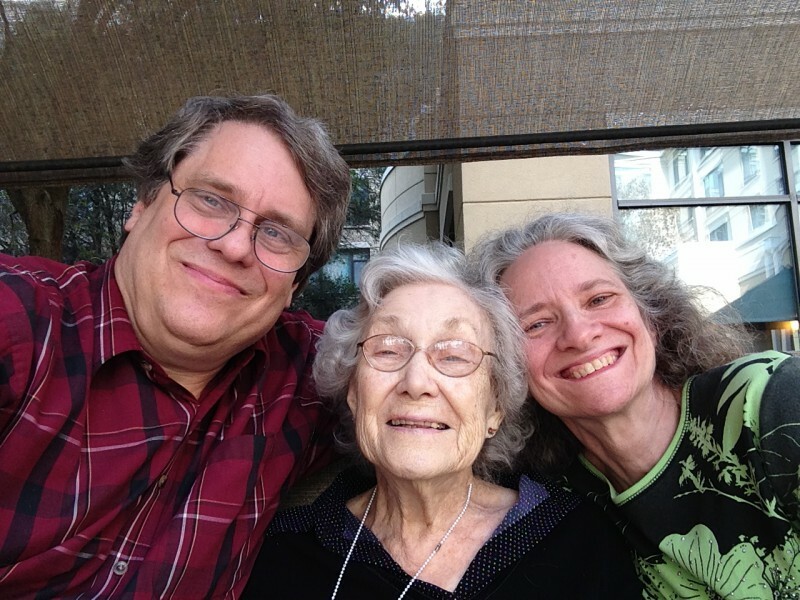 Paradoxically, the Alzheimer’s that has been apparent for about ten years has one silver lining, if you want to call it that: it spares her from concern over her other medical issues. We had a rather amazing series of exchanges in a clinic waiting room during the week of January 19. My mom Bertie, my brother Rick and I all troop in and sit down. Rick and I had agreed beforehand to shield her from unnecessary worry. We intended to avoid mentioning cancer unless and until we had a definitive diagnosis. So Rick and I are all, “Well, the three of us just happen to be sitting here in this office.” Then Mother looks up. There, on the opposite wall, emblazoned in metallic letters at least a foot high (this is Texas; everything is way oversized) are the words “TEXAS ONCOLOGY.” With a star. A lone star. Did I mention we are in Texas? My mom goes, “What’s oncology?” Both her parents, her husband, and her first child were killed by cancer. She knows what oncology is. Furthermore, she was the first of her family to go to college, and graduated with a 4-year degree. In the depths of the Great Depression, I might add. She is one smart, capable lady. Anyway, my poor brother, taken totally off guard, answers with a verbal smoke screen. In order to spare his dignity, it won’t be repeated here. He follows it up with, “Hey, let’s look at this cool magazine.” Bertie is satisfied for the moment. With the Alzheimer’s, moments are all she has. We wait. We meet the oncologist. Tests and treatments are scheduled. Rick returns to his home and work in Arkansas. Bertie and I are back in the office. Rather distracted, I sit us down in the same spot. We look up. Oops. Sherry: It is the study of cancer in the body. Bertie: Do I have cancer? This was true at that particular point in time; we were waiting for the test; I am not about to start lying to my mother now. Help! what on earth do I say here?!? Sherry: Would you want to know if you did? Bertie: (considers for a moment) I don’t believe I would. More waiting. Tests and treatment follow. The diagnosis is communicated to me over the phone. I speak with Rick. Bertie and I are back for treatment #2. Somewhat more alert, and mindful of my mother’s Tuesday guidelines, I park us facing away from the offending wall. I congratulate myself. After a few minutes, in walks another patient or family member/caregiver, a long TALL Texan, with a great big chest that would do a linebacker proud. There is a sweatshirt covering that enormous chest, emblazoned with, yes, TEXAS ONCOLOGY. Sherry: Hey, let’s look at this cool magazine. And I’ve been steering the conversation ever since. Actually, she hasn’t even come close to asking about oncology since that day, even when we had to pass that noisy wall three more times during subsequent treatments. Anyway, she still knows me, and really enjoys my company. We made a scrapbook, look at old family pictures, cackle over cute animal youtube videos on my teensy iPad mini, and sing old songs together COMPLETELY off key. Neither one of us can carry a tune, and neither one of us cares! What a pair. Meanwhile, I wrangle assisted living services, hospice services, insurance, and forms requesting leave from my job. I wait for the oncologist, the gerontologist, and all and sundry. I watch Bertie like a hawk, and inspect the various caregivers. No one gets near her without my approval. Caregivers clean my mom, her clothes, and her place, and then I clean again. Is this what it’s like to have a child? I shuttle back and forth between New York and Texas. My heart wants to be here with Bertie and I would just stay, but my sick days are gone and my vacay is almost used up. The leave should start soon, but I worry it won’t be long enough to take care of her the way I want to. Each day I try to find the right balance. When I go home to New York, I hire extra caregivers, which works pretty well as Bertie’s dementia has brought her to a place where she likes everything and everybody. I’ve never seen anything like it; but her current state of mind actually seems to be working for her. I fly back to New York this Friday, and experiment with a schedule of working for 4 days, with 3-day weekends in Austin. My heart wants to be here, but my mom would want me to be practical. It is a bit lonesome down here. My social life is limited to the completely charming young bartenders in my hotel. NOT that I am drinking a heck of a lot, mind you … they know my story and don’t push. Hanging out in the hotel bar is pretty funny for someone who has darkened the doorways of 5? maybe 10? bars in her entire life. Sometimes I speak with random hotel guests. One evening I left my New Yorker wariness up in the room (Texans are friendly; it certainly can be disarming), went down to the bar, ensconced myself in my usual spot (I have a SPOT!!!) and got smooched by a random hotel guest. “Blech,” as Lucy says in Peanuts cartoons. It is a gift and a privilege to care for my mother at the end of her life. I have no idea what I’m doing or how I am finding the strength. I am making it up as I go along. I am making mistakes. Lots. Making these decisions may be the hardest thing I have ever done. It may be fairly obvious, but nevertheless, Sherry would like to emphasize that she is not laughing at her mother. Rather, she is making fun of her own discomfiture and that of her brother. And TEXAS. Definitely lampooning Texas. As a former Texan herself, now transplanted to New York, she is eminently entitled to satirize. When she is not commuting to Austin, Sherry works around the corner from Erica, making the world safe for Corporate America. Thank you Sherry for a beautiful and powerful piece. Hold on to your humor always, and fly through these stormy days with your New York chops and Texan heart…you are a warrior! Your mom raised a beautiful soul. It is my hope that I have half the strength you have when it comes time for my mother. Thank you for sharing your story. brooklynsoul and JC, thank you for your very kind words! I treasure every bit of moral support that comes my way. Rick and I were back with Bertie today. The three of us quietly had a blast. I am quietly astounded. Sherry. Greatly admire Sherry’s courage, kindness and good humor. My best wishes to her mom and family. Matt, I will share your comments with her. Thank you. All the best to your mother. A loved one was recently diagnosed with a aggressive type of cancer and it has not been easy time, so I understand what you are going through. Wishing you strength and wisdom as you tend to your mother. This is lovely. I hope I have someone to care for me this way when my time comes. What a blessing for you and your mother.